List of Medical Colleges In Himachal Pradesh: Himachal Pradesh is well known for the best tourism place in the world. People come here to spend their summer vacations or enjoy their honeymoons. Himachal Pradesh is not popular in the education field as like other states. But still, there is some govt. and private medical colleges. 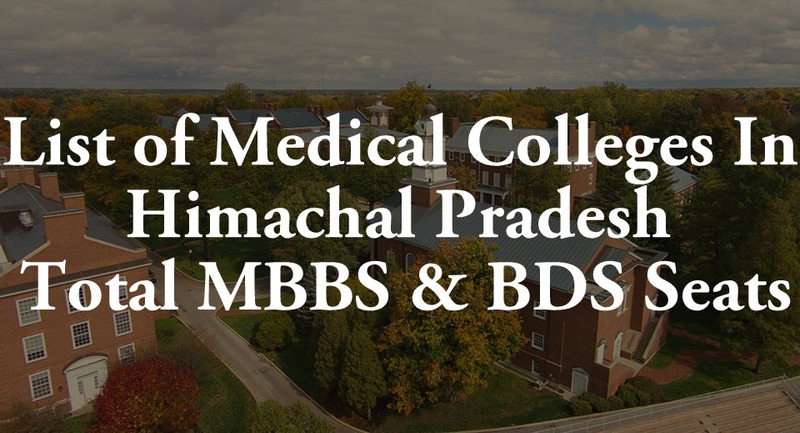 We have listed all medical colleges in Himachal Pradesh in this article. The government of Himachal Pradesh will fill their all MBBS and BDS seats through NEET 2018 Counseling. You can get more information about NEET 2018 Result & counselling below. The government of Himachal Pradesh will fill their all MBBS and BDS seats through NEET UG 2018 Counseling. You can get more information about NEET 2018 Result & counselling on this website that is fully dedicated to NEET 2018. As we know, this year NEET will be the only entrance exam for all medical seats. No states are allowed to conduct their own medical entrance examination, according to the supreme court. Dr. Rajendra Prasad Government Medical College, Tanda, H.P Himachal Pradesh University Govt. 1996 100 Recognized for 50 seats. Permitted for renewal of permission for increase of seats from 50 to 100 for 2012-2013. We hope you find this article useful. Make sure to bookmarks and subscribe this page for more upcoming updates of NEET UG 2018. There is one more best Govt.Medical College in Himachal Pradesh.Full name of the college is:Dr.YSP Govt.Medical College Nahan-Sirmour,Capacity 100 seats per year from 2016 onwards.Kindly update on your site. Thanks for this information Uma! Neetresultcounselling.In Does Not Hold Any Right Of NEET Entrance Exam. All Information Provided Here Is For Information And Education Purposes. We Are Not Linked To CBSE In Any Way. This Website Was Created To Aware Aspirants About The NEET. Students Should Always Check The Official Site For Exact Information As CBSE Has Right To Change Data.